[Image: The "buried cable intrusion detection sensor," courtesy of G-Max Security]. 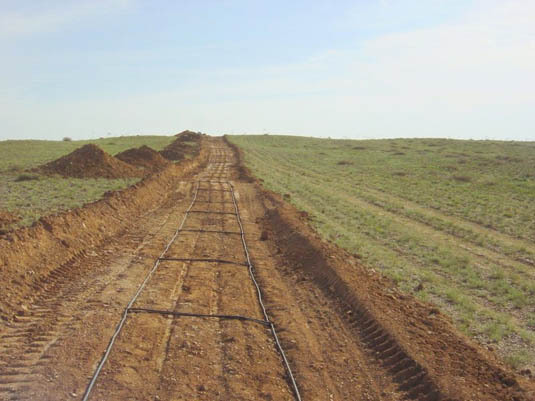 1) The Israeli-based company G-Max Security makes a "buried cable intrusion detection sensor" that is "totally concealed and operates effectively under any type of surface," from open fields and highways to mountains, snow, and ice. 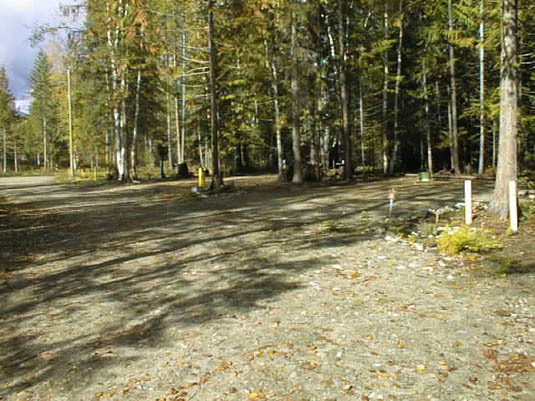 It acts as a "perimeter detection ring" that uses "Passive Magnetic Detection" technology—that is, a buried cable-sensor network—assuring "effective Early Warning of any perimeter intrusion attempt." This security geotextile is, in effect, an electromagnetic nervous system in the ground. [Image: The sensor after burial, courtesy of G-Max Security]. However, the system perhaps also foreshadows the implementation of much more complex, spatially ubiquitous, and locally intelligent geotextiles that could monitor, from below, in real-time, and with remarkable accuracy, everything that passes through the landscapes above them. 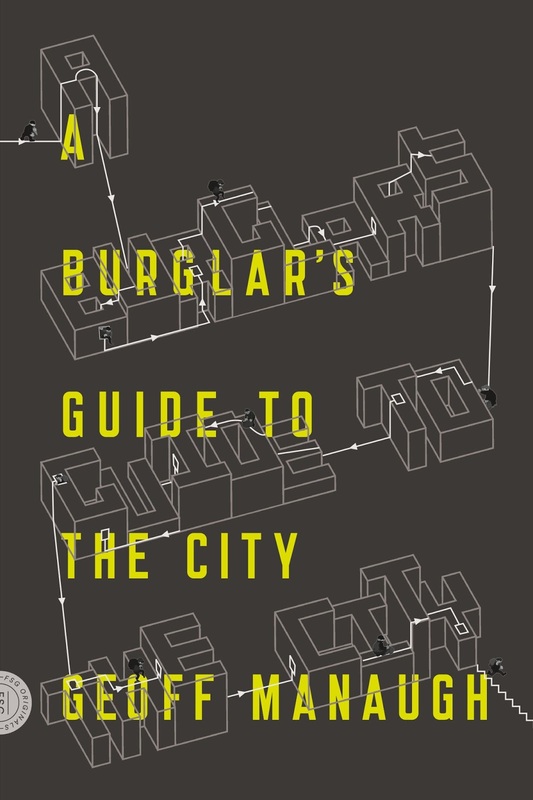 The most secure landscape in the world could thus someday be an open field—or friendly suburb—peppered with trees and flowers in which all of the surveillance technology is passive, omniscient, experientially invisible, and indistinguishable from the earth. As a useful replacement for land mines and electrified fences, however, the very idea of a security geotextile brings an alarming potential for weaponization. For instance, what would stop such a system from being given the ability to electrify, stun, immobilize, or even kill a detected intruder? Perhaps this would be the malign or malevolent geotextile I ask about in my essay for Philip Beesley's recent book, Hylozoic Ground. Either way, it will be interesting—and unfortunately necessary—to track the potentially emergent field of weaponized geotextiles. 2a) The Dutch engineering firm TenCate offers a product called the GeoDetect system. It is "the first sensor enabled geotextile on the market to provide soil reinforcement, structural health monitoring and an early warning system into one package." It is a computational fabric that structurally strengthens and physically monitors the landscapes it is buried within. 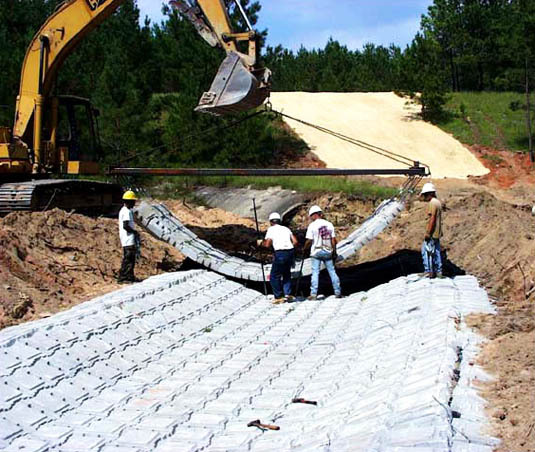 "Our 'intelligent geotextile,'" the company points out, "is the first system designed specifically for geotechnical applications and offers a technical solution for monitoring geo-structures for changes in strain, temperature or the combination of the two." As such, it "incorporates a geocomposite fabric, fiber optics, instrumentation equipment and software to provide a innovative solution for the multi-functional requirements of a geotechnical application" (for example, stabilizing landfills and levees). You can watch a short video about it here. 2b) To speculate a bit here, if TenCate's GeoDetect is basically a 2D computer or sensor network, then, given further processing power and mechanically augmented with servomotors, a future version of this system could perhaps not only engage in locally autonomous decision-making—a kind of 2D supercomputer disguised as a landscape—but could also physically rearrange itself to protect against impending disasters (such as levee failure or an avalanche). 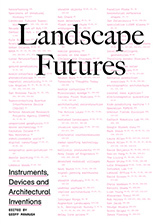 We might thus find that sentient artificial landforms built from networks of computational geotextiles and mobilized from within by servomotors could literally redesign landscapes in place, on their own, at will. This would, presumably, be for practical purposes (flood mitigation or landslide control), but could also be purely for aesthetics. Imagine a new park of crawling landforms—slow ripples moving through the grass, forming constantly refreshed hills and valleys, the soil pulsing in waves. [Image: A photo by Toshio Shibata]. These speculative geotextiles, otherwise invisible beneath the ground, could use their own algorithms to monitor visitor activity and thus compute the appropriate spatial response to those visitors' location in the park. Given such a scenario, the entire Dutch coast could someday be, we might say, a robot: a self-intelligent system of interacting mechanical fabrics that rearrange on their own volition, on the scale of hundreds of miles, to keep Atlantic floodwaters at bay. The art of landscape photography is revolutionized. Bewildering art films are set amongst this crawling landscape. Slow hills move and dance in front of the sun. [Image: An otherwise unrelated photo of concrete block installation atop a geotextile base, courtesy of the Directorate of Public Works, Ft. Jackson, South Carolina]. 3) These technologies could, of course, be networked yet further, off-site, to other unmanned and interactive technologies. We might describe this as a semi-autonomous landscape-to-robot constellation. 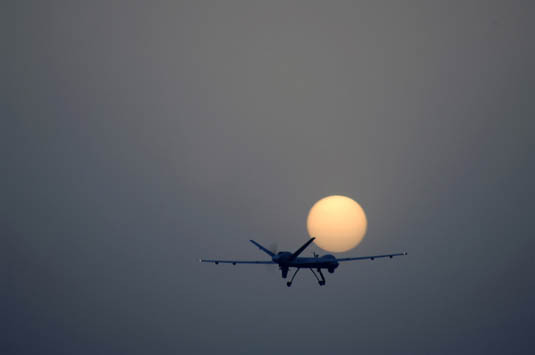 [Images: "An MQ-9 Reaper remotely piloted aircraft takes off July 17 from Joint Base Balad, Iraq. The Reaper can loiter over battlefields or targets for hours at a time without refueling and carries up to 3,750 pounds of laser-guided munitions, giving ground commanders unprecedented situational awareness and the ability to bring the right amount of force to bear on a target. (U.S. Air Force photo/Tech. Sgt. Richard Lisum)"]. In effect, this would terrestrialize the so-called robot-readable world: burying the signs and sensors that such machines require and disguising them in apparently natural circumstances. What appears to be a meadow is actually an electromagnetically active runway read and used by UAVs. What you think is a forest is a complex signaling landscape. What appears to be a garden is a computational geotextile interacting with driverless ground vehicles miles away. 4) In any case, all of the above ideas could, perhaps much more interestingly, be used to activate a kind of anti-drone defensive landscape. As the horrific possibility of drone proliferation looms, what spatial and geographic countermeasures could be implemented to mislead, confuse, detour (or détourn), and otherwise deflect pilotless vehicles? The "perimeter detection ring" examined above, for instance, would instead be used to repel or otherwise blind "intruding" UAVs and UGVs; this could be used for everything from keeping a foreign power's drones out of your sovereign airspace to preventing the IRS from flying drones over your suburb for property tax purposes. In mythological terms, this would be the geotextile as talisman, or terrestrial ring of protection. 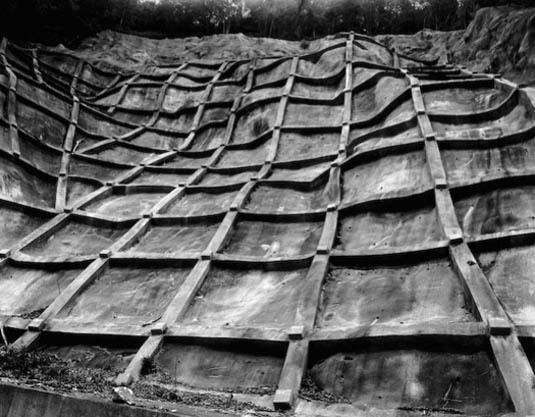 [Images: Geotextiles, courtesy of the U.S. Federal Highway Administration]. So what possibilities exist for landscape architects to, as it were, resist drones, using signal-jamming geotextiles, electromagnetic dazzle effects, or even bizarre new forms of robot-readable camouflage, in order to make drone warfare all but spatially impossible? Could anti-drone landscapes be added to existing cities—urban spaces or architectural forms lethally confusing to robots—and what might such additions actually look like (if they would be visible to humans at all)? (Thanks to Rob Holmes and Brett Milligan for first alerting me to the GeoDetect system). I would be interested to know the golf community's opinion of this technology. A course that physically rearranges itself! That would add to its strategic possibilities. I will bring this up at my favorite golf blog. Thanks. Very interesting piece, although I'm having trouble getting over the physical impossibility of 2b. "given further processing power and mechanically augmented with servomotors, a future version of this sytem ... could also physically rearrange itself..." Those would have to be some damn powerful servomotors, earth is pretty heavy. And a lot of them at that, and they won't be cheap. And you would really need more than one per joint if you want 2d articulation. And they could only lift up, you can't really push down into the ground, and that lifting up would create vacancies below so there would have to be a structurally supportive element as well, unless you just want to give that load to the motors in which case they have to be even stronger. And then there's the issue of the havoc that an undulating landscape would wreck on the root systems of the grasses/ground plants planted in said landscapes. Plus after a few uses the hills would sort of 'settle' into the underlying sketchup-like geometries that aren't really round no matter how hard you squint. I think I'm taking this too literally, but as for the more realistic applications, very interesting and potentially very useful. Or maybe, you could use this technology to keep your canine friend within the confines of your own yard! Oh, wait...that sounds familiar. Interesting article but i feel you're missing the emerging trend slightly. 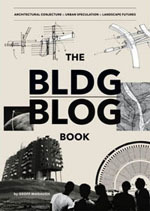 With the increasing miniaturization of computing power being the dominant technological shift, the people in positions to do this sort of large scale infrastructural installations for autonomous purposes are going to be almost exclusively the military-industrial complex and the police services (weaponizing this technology for warfare/surveillance at the behest of government). Diluted remnants of this infrastructural wiring and re-wiring may then filter into the hands of large companies looking for ways to automate uav's/robotic technology for efficiency savings. That'll be as close as the average citizen will get to large scale infrastructural geo-robotics, since they'll never have the time, money or permission to carry out infrastructural projects for autonomous reasons unless they act co-operatively. Much more likely that if the concerned citizen should want to establish countermeasures to drones they will be on a far smaller scale to that being speculated here. I think your predictions on governments using these technologies against each other, in robotic proxy wars of detournement and sabotage have potential, especially when considered alongside the emerging technological capacities for waging cyber-warfare.